Kurt A. Grimm, DVM, MS, PhD, DACVA, DACVCP, is the Founder of Veterinary Specialist Services, Conifer, Colorado. William J. Tranquilli, DVM, MS, DACVA, is a Professor Emeritus at the University of Illinois College of Veterinary Medicine and the President of Veterinary Outdoor Recreation and Continuing Education (VORCE) Inc.
Leigh A. Lamont, DVM, MS, DACVA, is an Associate Professor of Anesthesiology at the Atlantic Veterinary College, University of Prince Edward Island. The book has been restructured from the previous edition, with many chapters reworked. 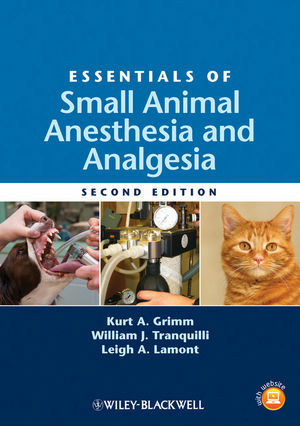 The first-edition chapter on anesthesia management of patients with disease has been replaced by seven new chapters on anesthesia for patients with specific disease written specifically for this book. Offers an increased focus on pain management. The first edition was presented entirely in outline format, but the second is written in a narrative (but still accessible) format. Now includes a companion website with review questions and answers; additional figures and video from the authors’ (very well known) Made Easy book with Teton New Media may also be included. features review questions and answers, video clips, and an image bank with additional figures not found in the printed book.